Free Shipping Included! Octane Fitness xR4x Elliptical Trainer by Octane Fitness at M's Dance Center. MPN: 109500-001/109610-001. Hurry! Limited time offer. Offer valid only while supplies last. The unique XR4 ride recumbent elliptical has revolutionized seated workouts, and is a high-quality, value-priced, total-body machine for home use. 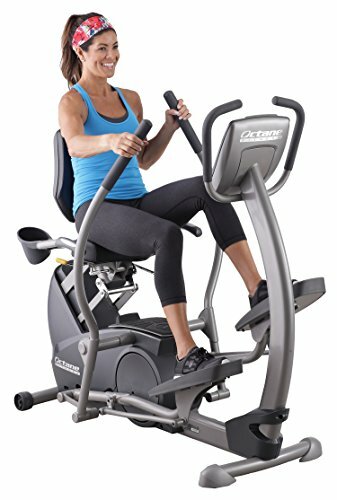 The unique XR4 ride recumbent elliptical has revolutionized seated workouts, and is a high-quality, value-priced, total-body machine for home use. Its exclusive design with Power stroke technology enables exercisers to benefit from up to 3x more glute activity and up to 23% greater caloric burn than recumbent bike riders. The active seat position ensures a custom, comfortable fit and maximizes muscle use, and ergonomic handlebars provide full upper-body engagement. Exclusive workout boosters let you incorporate strength training intervals and cross training to improve results. A variety of programs add Motivation and challenge to continue progress. This exceptionally durable, compact machine fits anywhere in your home. Individual results will Vary. Source: 2007 St. Cloud university human performance lab Study. If you have any questions about this product by Octane Fitness, contact us by completing and submitting the form below. If you are looking for a specif part number, please include it with your message.